Windmill Oil Tank Service, Inc.
Windmill can install above ground indoor and outdoor oil, diesel and gasoline tanks. 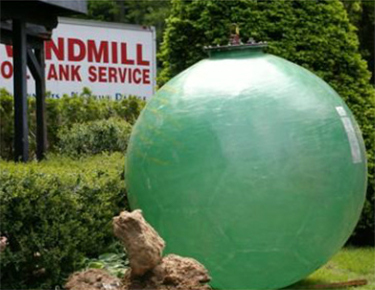 Windmill offers tanks which vary in shape, size and configuration. Our most popular above ground tanks include the widely used Granby 275 gallon and 330 gallon. These tanks can be used either indoors or outdoors. We are a platinum awarded Granby installation contractor. 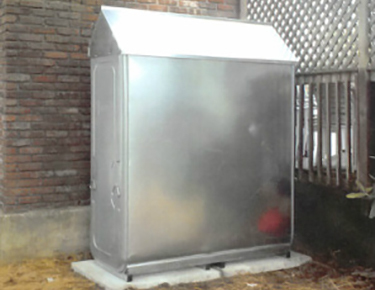 Residential double-wall oil tanks manufactured by Roth are also available. Double-wall construction provides 110% capacity of the inner tank for maximum protection. These vertical tanks are a great way to save space in a basement or are easily concealed outdoors. They can be used for heating oil, diesel and bio-fuels. 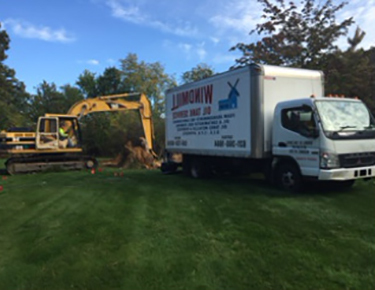 For residential buried tank installation, depending on the county, we offer a variety of state-of-the-art buried tanks. Single-wall or double-wall fiberglass tanks, steel cathodically protected tanks (STPI), fiberglass wrapped steel tanks, and ACT-100 epoxy-coated tanks are available. Windmill's commercial installation crew has extensive experience installing fuel oil, gasoline, diesel and waste oil tanks with above and below ground applications. For commercial use, Windmill will review or engineer plans in compliance with County and State regulations. 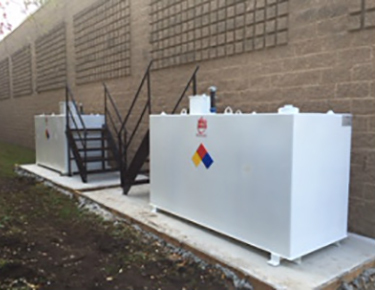 Image shows two 1,000 Gallon Above Ground Tanks for Commercial Use. These Tanks are a great alternatives for large buildings with separate boilers for covenient and efficient multi-tank systems. In Nassau and In Nassau and Suffolk counties, most tanks less than 1,100 gallons can be abandoned with foam (depending on the water table). In New York City, any size tank can be abandoned with foam. Prior to the abandonment, an approved waste oil truck with vacuum capabilities will remove any oil, water or sludge remaining inside the tank. Once the tank is vacuum cleaned, Speedy Dry is used to absorb any residual oil. Then, the underground oil tank is completely filled with approved foam. Lastly, the fill and vent pipes are removed and the openings are filled with cement to render the tank completely unusable. Upon completion of the work, a certificate of abandonment will be issued. Sand abandonments are necessary in areas where there is a high water table. In order to sand abandon an underground oil tank, first the top of the tank is excavated and cut open. Then all remaining contents are removed using a truck with vacuum enhanced capabilities. 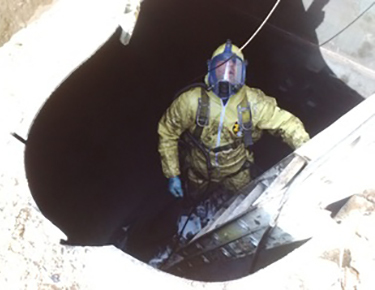 Then, a confined space entry team enters the tank to completely clean the tank bottom and inner side walls. The final phase is for the technicians to completely fill the tank with sand. Once the tank is filled, the technician closes the tank, backfills the excavation and removes all piping associated with the underground oil tank. The holes for the fill and vent pipe are cemented shut and upon completion of the work, a certificate of abandonment will be issued. Slurry, or abandonment using cement, is necessary for tanks over 1,100 gallons that must remain in place due to engineering constraints. The process is the same as that of a sand abandonment, except that cement is pumped into the tank instead of sand. Slurry is not usually necessary for residential tanks. In the event that a slurry abandonment is required, Windmill will contact the proper government agencies on your behalf to obtain written permission prior to commencement of the work. Upon completion of the work, a certificate of abandonment will be issued. 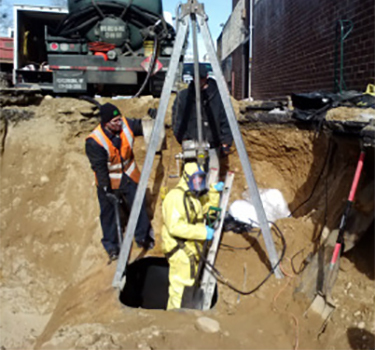 Here is a confined-space entry team entering an underground oil tank to properly clean out the remaining tank contents. Above ground or basement tanks which are no longer in use can be pumped clean of any residual oil and picked up by our crew. The whole process takes less than an hour. It's as simple as that. Windmill has the ability to remove any size tank. 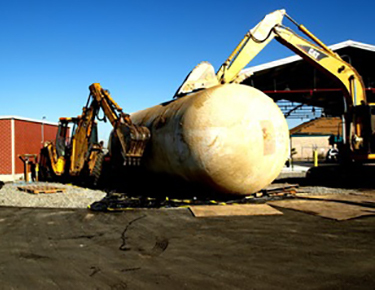 The process for removing an abandoned buried tank is similar to that of installing a buried tank. The tank is excavated, leaving some extra room on all sides to make removal easier. The tank is then cut open and pumped out with a vacuum truck. A crew of highly trained tank technicians then enter the tank, and clean the walls and bottom to prevent any remaining oil from spilling out during the removal process. Finally, the tank is removed from its grave and disposed at a licensed facility. The excavation is then filled in with clean fill. If the ground should sink or settle in the future (which is unlikely because our adept crew makes every effort to pack and level the soil at the time of excavation), we will return to add more fill if needed. 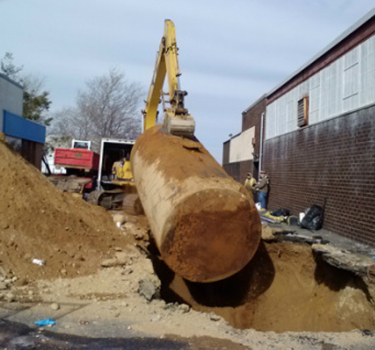 This is an unused underground oil tank being removed. 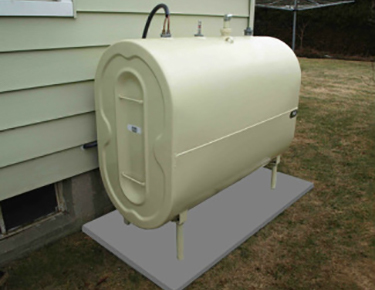 Depending on the model, our oil tanks come with a 10-30 year warranty. Our most popular tanks, the Granby 275 gallon and the Granby 330 gallon come with 10-30 year warranties. The Roth double-wall comes with a 30 year warranty. The ACT-100 epoxy-coated underground tanks come with a 30-year guarantee. All tanks installed by Windmill come with pollution liability insurance from the tank manufacturer (up to two million dollars per occurrence.) With new tank installations, oil can be stored in a safe, clean, and reliable manner with out worry. Windmill has a fleet of waste oil trucks with vacuum enhanced capabilities which can pump unwanted water, oil and sludge out of your tank. The vacuum trucks can remove the contents from any size tank. Windmill is licensed to transport these materials and can issue the proper paperwork and manifests which will depict the legal disposal of such tank contents. It is recommended that potential buyers test the existing oil tank or the surrounding soil for leakage prior to purchasing a new piece of property. A spill cleanup is a costly and strenuous process, one which can be easily avoided by proper tank maintenance and observation. If you are suspicious that your tank is leaking, please do not hesitate to set up a test. To ensure that storm drains are always in working condition and to avoid any potential flooding, storm drains must be cleaned and maintained regularly. We, at Windmill Oil Tank Service, are experts in commercial and municipal storm drain inspections, cleanings and repairs. 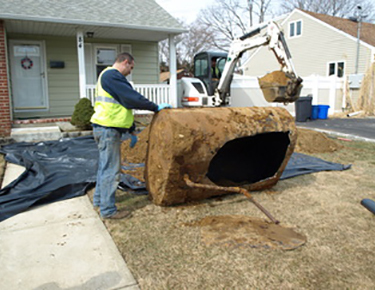 Give us a call at (631) 360-8901 for a free consultation or to schedule routine maintenance of your storm drain.